Outraged citizens recently helped persuade Gov. Jay Inslee to veto an ill-considered bill to limit public disclosure of legislative records. But your right to know what’s being done in your name is far from settled. Senate Bill 6617 was triggered by a news media lawsuit challenging the Legislature’s refusal to obey the Public Record Act. The court ruled that lawmakers must obey the act. Nonetheless, what happens next depends on negotiations between lawmakers and the news media. The Legislature has defied the records act since 1972, when it was passed by an initiative of the people. In 1971, citizens passed an open meetings initiative that forced public officials to conduct the public’s business in public. Both initiatives aroused the same indignant protests and dire warnings we’re hearing from legislators now: complying with the records act is too burdensome, invasive and expensive and would invite a deluge of nuisance requests. So how to explain that all other state entities have complied with the records act with minimum fuss for 45 years? With impressive bipartisanship and speed, lawmakers in February overwhelmingly passed deeply flawed legislation initiated by the Democratic leadership to exempt themselves from the records act. SB6617 was our lawmakers’ “emergency” answer to the ruling by Thurston County Superior Court Judge Chris Lanese confirming that the act applies to the Legislature. Faced with public uproar after passing the bill, legislators claimed it was “widely mischaracterized and misunderstood.” But the worrisome attitudes that birthed this misbegotten measure speak for themselves. Opponents of the bill (21 of 147 lawmakers voted no; all of our local incumbents voted yes) were forbidden to speak against it on the floor; it sped to passage in two days. The Legislature’s legal argument for ignoring the records act hangs on a fanciful thread: that the Legislature is not a government “agency.” Lawmakers also claim they exempted themselves from the act by changing the definition of public records. This disheartening episode not only calls into question the competence of these legislators to legislate. It highlights an alarming ignorance by many lawmakers of the government watchdog role news media perform on behalf of citizens in a self-governing society. Whatever were these lawmakers thinking? Hello? They’ve said, in scripted unison, that they regret the haste that was necessitated by the judge’s refusal to stay his decision. But the Legislature never asked him for a stay, according to the Tacoma News Tribune. A stay request to the state Supreme Court is pending. Legislators contend SB6617 improved the Legislature’s accountability. And it did, sort of. Communications with lobbyists (but not constituents), lawmaker’s calendars of meetings (minus locations) and final reports on disposition of sexual harassment complaints against lawmakers would have been released. But not records dated before July 1, 2018. Those apparently were to be sealed forever. Oh, please. Newspapers are not in the business of invading people’s privacy without a legally permissible, compelling public interest justification, and legislators know it. Newspapers throughout the land keep an army of lawyers well fed expressly to avoid falling afoul of privacy and libel laws. Stalking, it seems to me, demands a better solution than conducting public business in private. The Legislature’s most Orwellian assault on the public’s right to know was the provision denying citizens all rights to judicial appeal — and the right to launch an initiative of the people — to obtain records. Legislative committees were to have sole authority to release them. Worse yet, the same committees that denied records requests were to make final rulings on appeals challenging those denials. Huh? Politicians’ hostility to the news media is understandable. It springs from fear of losing control of the narrative. Information is power, and politicians chafe at sharing both. Even the best of lawmakers — and there are more than you think — resent having to concede that news media also legitimately represent the interests of their constituents. Given the unprecedented presidential effort to undermine the credibility of journalists, Washington’s news organizations quite rightly have made it crystal clear that they mean to defend their right to tell you — and thus defend your right to know — what your government is doing. 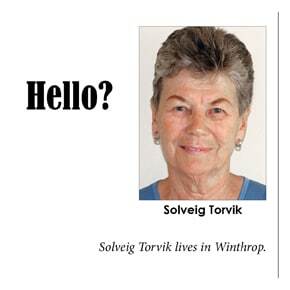 Solveig Torvik began her newspaper career in Seattle in 1971. She lives in Winthrop.